Having spent many hours following Davos live, followed by a further bunch of hours ploughing through the opinions and comments from people who were there (a rum bunch indeed! ), I’ve decided to pass on my own thoughts and opinion of the Forum, and particularly its showpiece, the so-called Fourth Industrial Revolution. The first and only Industrial Revolution I’m aware of, began at around 1760, when the CO2 in the atmosphere was at a nice comfortable 280 ppm having fluctuated between 180/280 ppm every hundred thousand years or so for at least the previous million years. It did indeed harness steam power which enabled us to replace muscles with machines, and it also kick started the changes that have brought great social and economic benefits to those of us who were lucky enough to have been born in the western world. But there was a high price to pay for these benefits which we are still paying and which our grandchildren will have to pay for the rest of their lives. Back in 1760 was the time when we let the genie out of the bottle, Coal become King, and we all started off down the Road to Armageddon. Through the second half of the 1800s all that Mr Klaus Schwab’s (originator of the ghastly Davos Jamboree) so-called Second and Third Revolutions did was feed and fatten up the Genie, and that’s exactly what the proposed Fourth Revolution will do if it ever comes to pass. The industrial machines will just spin a bit faster and global growth will climb a bit further up the exponential curve. As around 90% of Global Primary Energy is provided by fossil fuels, and as the burning of fossil fuels produce CO2, any further economic growth must result in more energy being used and more CO2 being produced. 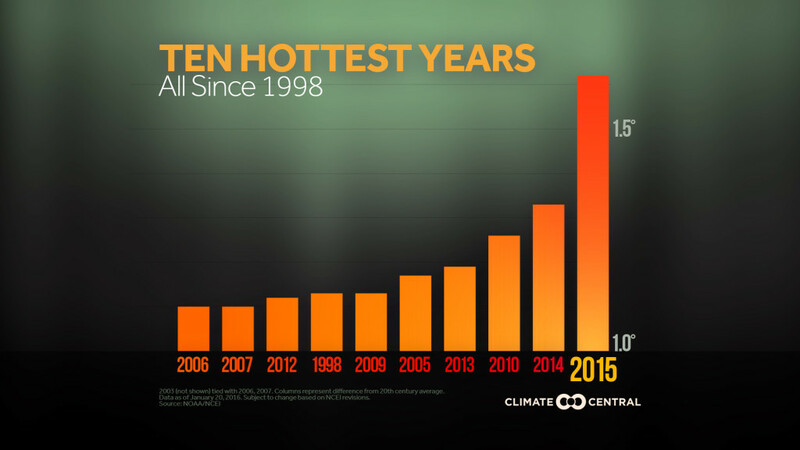 As of today, the biggest threat to our survival is Global Warming, and if you still don’t know that it’s caused by too much CO2 in the atmosphere, then you’ve just not been paying attention. But don’t just take my word or even the scientists word for it. In a speech to the insurance market, Lloyd’s of London, on Tuesday 29 September, the governor of the Bank of England, Mark Carney said that climate change will lead to financial crises and falling living standards and that insurers were heavily exposed to these climate change risks. He warned that the challenges currently posed pale in significance compared with what might come, and that time was running out to deal with global warming. 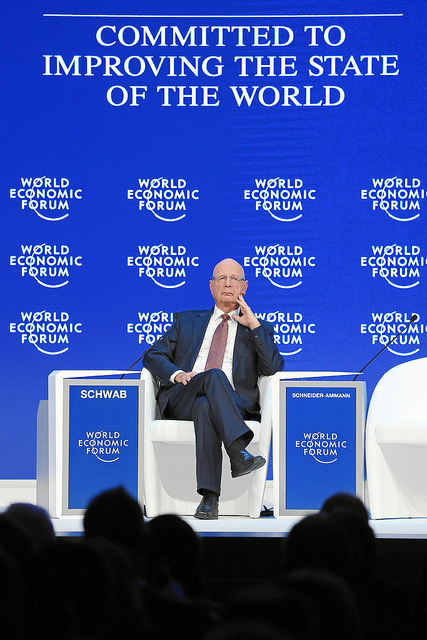 Surely in the year 2016 all of this makes Mr Schwab, his World Economic Forum, his Fourth Industrial Revolution and his annual jamboree in Davos — with its mad quest for economic growth — all just an irresponsible and rather dangerous indulgence and now a complete irrelevance. 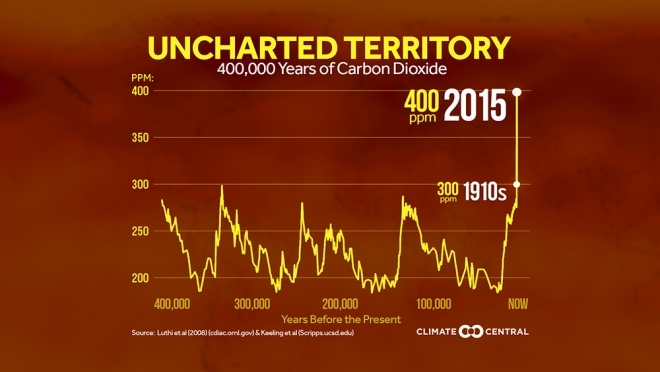 Year by year the rate at which the atmospheric CO2 level rises is increasing at an alarming speed, and as we have never been here before, we are now sailing in completely uncharted waters. Based on figures taken from the 2015 Credit Suisse Global Wealth Datebook, Oxfam published a report just prior to Davos 2016 showing that just 62 people now own more wealth than the poorest 50% of the world population, which is about 3,200,000,000 people. While Mr Schwab’s World Economic Forum’s Global Risks Report 2016 was spot on in getting Global Warming as the top risk, the gap between the worlds rich and poor was spiralling out of control. Yet in their wisdom, the 750 experts didn’t even rate this danger and injustice in the top 5. Taken together, Global Warming and the massive and still widening Gap Between Rich and Poor are both products of the one and only Industrial Revolution which started back around 1750. If together we don’t very quickly now get out of our business as usual mode and start reducing both of these major risks, they will surely take us, and many more of the Planet’s species all to MAD, which as we know stands for Mutually Assured Destruction.